This has been a wonderful experience for me. I feel that these past few months have been the most educational months of my life because I was learning both in and out of the classroom. My mentors offered great guidance throughout the internship and always encouraged me to put academics first. 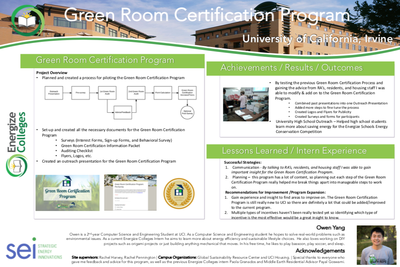 After seeing the green industry in action first hand, I have even began to reevaluate my career choices, and am considering pursuing a profession within the realm of environmental sustainability now. Please keep running this program! 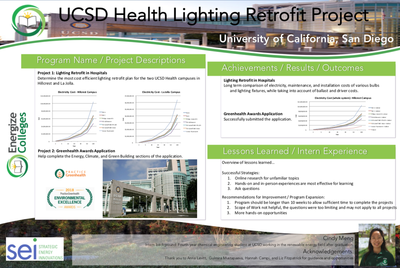 The Energize Colleges program adhered to my drive for sustainability in the field of architecture. 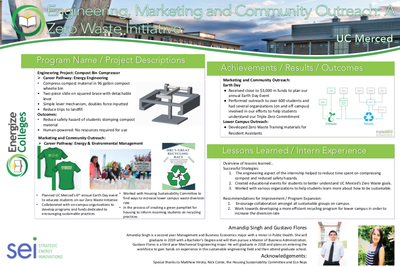 The internship has given me the opportunity to be involved with the environmentally minded movement of development. 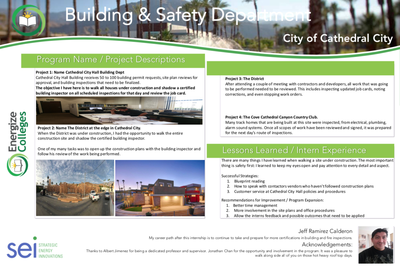 My internship with... HMC Architects, located in Ontario, California... focuses on the LEED Certification of the Mt. SAC Student Success Center and Athletics Complex East. 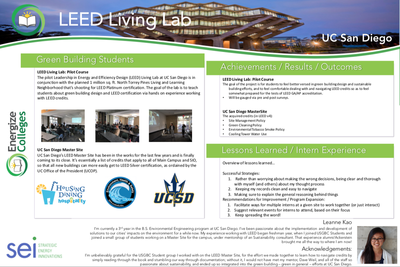 For my project, I studied... LEED-certified buildings, which are buildings with high performing sustainable features. 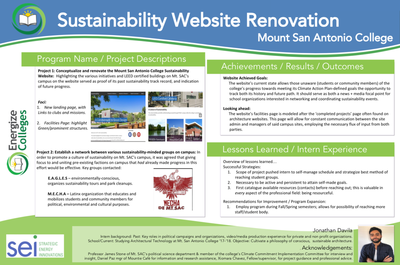 I created a curriculum that will be implemented into the new building to teach building occupants about the key sustainable features and LEED. 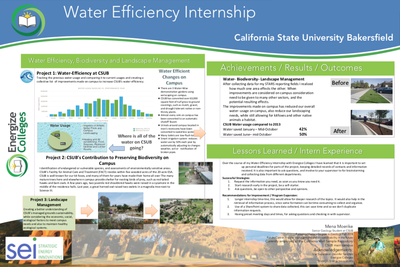 This internship has given me the opportunity to expand my knowledge on how crucial sustainability is for communities. 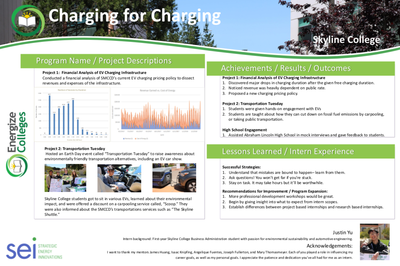 I have learned so much this past semester working with people from the construction field. 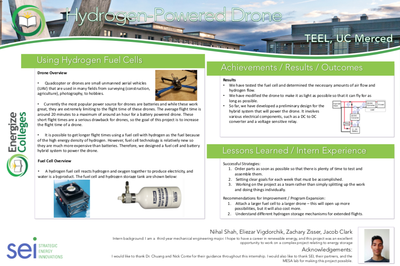 I am so grateful to have had this opportunity, and I would like to thank SEI and Energize College for offering students such amazing program. 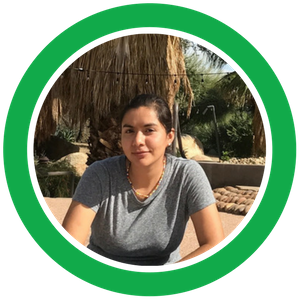 Our focus is to study biochar's water retention and soil improvement properties so that we can efficiently use agricultural "wastes" and forestry residues as biochar and enhance agricultural so that it can sustain itself through drought conditions. 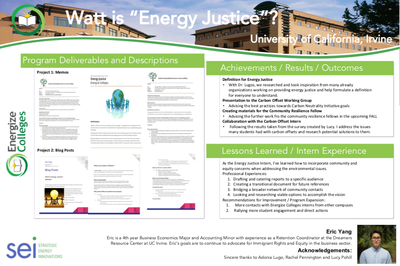 I joined Energize Colleges to promote our sustainability project, get the word out about anything and everything sustainability, and to have fun and meet others with the same passions as mine. 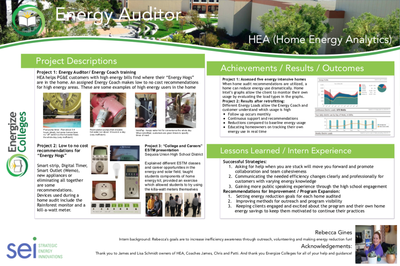 I shadow a few Energy Coaches on residential Home Energy Audits. Every home is different and we find a variety of inefficiency in each home. 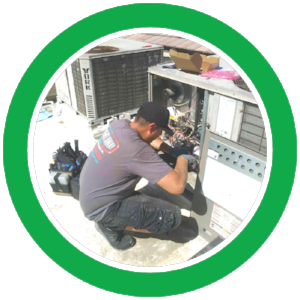 Our job and mission is to educate the home owner with different ways or devices to help with the inefficiency or Energy Leaks. 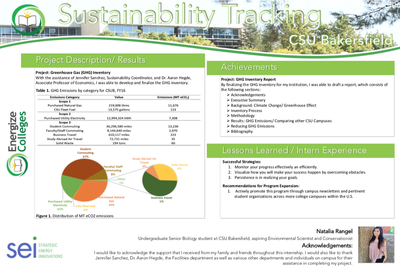 I am working with Facilities and Maintenance at Harvey Mudd College to collect sustainability data to produce a comprehensive STARS (Sustainability Tracking Assessment and Rating System) Report. I am also helping F&M to create sustainable data tracking templates for future reports . 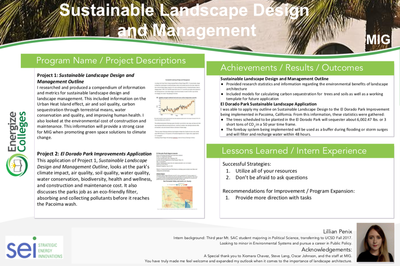 . . this internship has given me the opportunity to get hands-on experience in sustainability management practices . . . 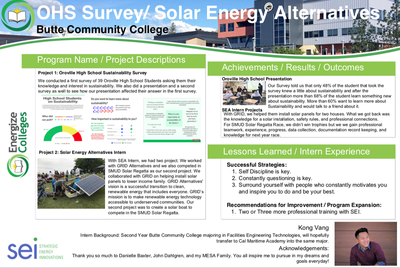 I facilitated [a] class on sustainable living and energy conservation at Webb Schools. 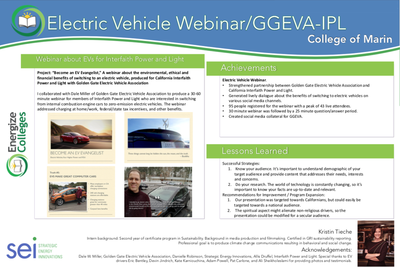 My hope is these high school outreach programs will prepare the next generation of environmental activists. 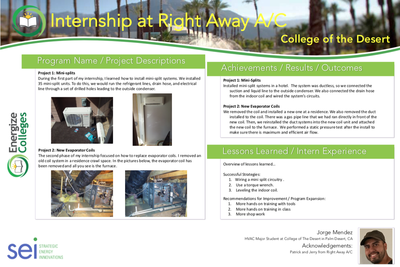 With this internship, I had the opportunity to not only observe the daily tasks and responsibilities of an architect, but also gain hands-on experience working with computer modeling programs, like Auto CAD, and construction documents that are used in real-life projects. 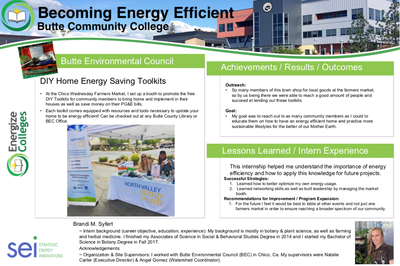 The internship was beneficial because I worked in a field that I am interested in with people who do what I would like to do someday. I learned a lot about architecture, team work, organization, technology and communication.